I've been putting a lot of thought into Joseph Cambell's monomyth or hero's journey lately. 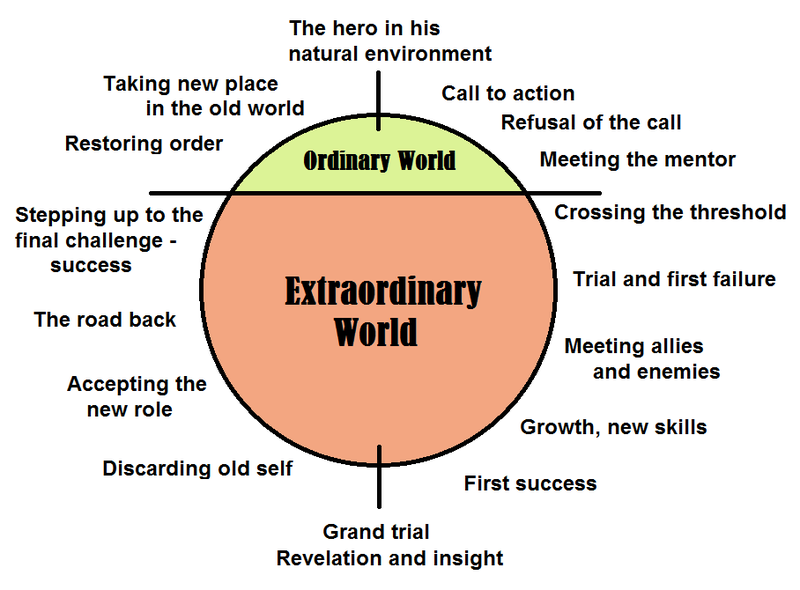 The monomyth is essentially the storyline that most epic tales of heroism and attainment follow. If you took the story of Christ and Buddha and countless other heroes, real or fictional, and laid them side-by-side, it would be as if the stories follow the same, prescribed routes. Campbell had the story broken down into 17 phases (some of which don't appear in this image.) Not all stories go through all the phases. But basically what happens is that the hero hears a calling. The hero denies the calling and/or encounters some sort of mystical aid. Then the journey begins and the hero leaps into an unknown and unfamiliar world knowing he will be forever changed. Once the journey begins, all sorts of stuff happens. The hero may experience true love. They will come across trials and tests and road blocks. Someone may try to distract them from the journey. Then they will ultimately confront their own ego, perhaps in a symbolic way with someone that holds power over them or a creature that is difficult to defeat. With the ego shed, they then become enlightened and their transformation is complete. They achieve their quest and must return back to their ordinary life, but perhaps they don't want to return or maybe they have to escape to return. They must learn to integrate their new knowledge into daily life. Some, like Jesus, may transcend life. Some may bring their new knowledge to the people. But all conquer fear and ego and, with that conquered, they truly are heroic. So that's the hero's journey. I imagine it could come in quite useful when writing books. But you can also apply it to your own life, your own quest. And that's why I've been thinking about it. And, full disclosure, the whole reason I've been thinking about this is because I watched Elizabeth Gilbert discuss it on Oprah's Super Soul Sunday a few weeks ago and found the ways she was applying it to human stories quite interesting. One thing she said really stuck with me and that was that the things the hero went through while on his quest, prepared him for the next phase of the journey. In fact, he can't get to the next phase until he's been tempered by the previous phases. So in order to approach your new life fearlessly, you have to experience fear, face your demons and strike them down. You have to mire through the muck and murk in order to learn how to avoid or circumvent it. I found this actually quite comforting. On our own journeys and transformations, I think we're sometimes afraid we're not ready to bring our new baby out into the real world. And we see our difficulties as signs were not ready. What if they don't like the baby? What if the baby barfs on someone? We want to protect our baby. So we refuse to bring it to the real world. But then again, we can't. Because if we're so afraid of what others will think about our baby, then we clearly haven't done the important ego work needed before we can return. The only way we can bring our baby to light is by doing our work. So there's really no such thing as being thrust into a role unprepared. If the universe opens up and gives you a doorway, it's because you're ready to walk through it. That's just the beginning of what's been on my mind since I started contemplating the monomyth. That and how each of us are on a series of heroic journeys, whether they're about our spiritual development or our purpose in this lifetime, that make take anywhere from a week to multiple lifetimes to complete. 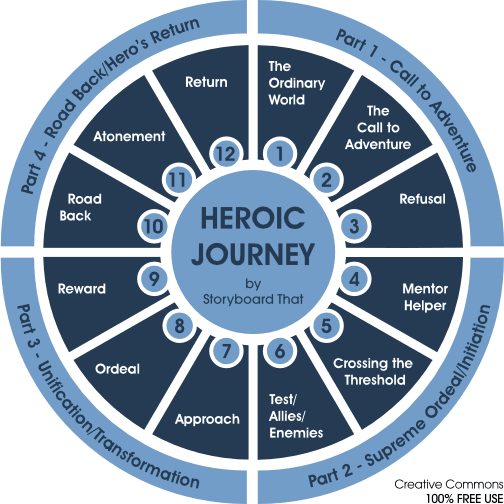 And it's interesting to think about where you are on a particular journey or if you can see how the monomyth applies to things in your life or how contemplating the monomyth might add some perspective to something you're facing today. Today there are 7 or 8 billion people carving out unique stories all around the world. It's mind boggling to think of. But as unique as each of those stories is, we all have so much in common. We worry about our loved ones. We have dreams for our life. We long to be understood and loved. And we're all running pretty much the same, prescribed obstacle course in life in our attempts to expand and grow. If you knew the stranger's eyes you were looking into were struggling with the same fears and heartaches as you today, could you turn away? Whether you agree with Joseph Campbell's hero's journey or not, we're all alone together on a ball hurling through space at alarming speeds, sharing a story that's far more alike than other story we're likely to encounter across billions of galaxies. We won't move past the bottom of the circle and commence on our upswing as a society until we're ready to look deep enough inside ourselves to see even the lowest among us as our fellow traveler on the journey.